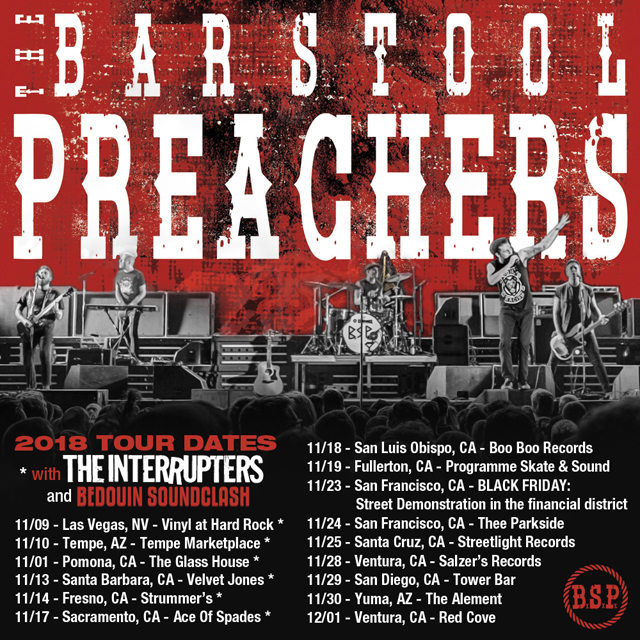 THE BAR STOOL PREACHERS are currently mashing up the nation on the West Coast of the USA on tour with THE INTERRUPTERS and BEDOUIN SOUNDCLASH, and they recently revealed that they will be supporting the legendary SKATALITES at San Francisco’s THEE PARKSIDE! Never content to leave well enough alone, the lads can now announce that they will be sticking around through the remainder of November, and have added even more shows so that no West Coast fans should have to miss them while they are out! In another bit of big news, they will be sharing the stage at San Diego’s TOWER BAR with Austin, TX punk rock veterans LOWER CLASS BRATS! Fitting for the BAR STOOL PREACHERS’ diverse sound, they are playing all kinds of different shows: from larger venues to barrooms to some of California’s best record stores, and even a street demonstration in San Francisco’s Financial District on Black Friday! Ever the men of the people, those PREACHERS! Check out the band’s full USA touring schedule below, and get your hands on tickets sooner rather than later! And if you haven’t yet picked up THE BAR STOOL PREACHERS’ latest album, GRAZIE GOVERNO from your friends at PIRATES PRESS RECORDS yet, well there’s no time like the present, so CLICK HERE TO VISIT THE WEBSTORE FOR THAT AND ALL YOUR BAR STOOL PREACHERS NEEDS!